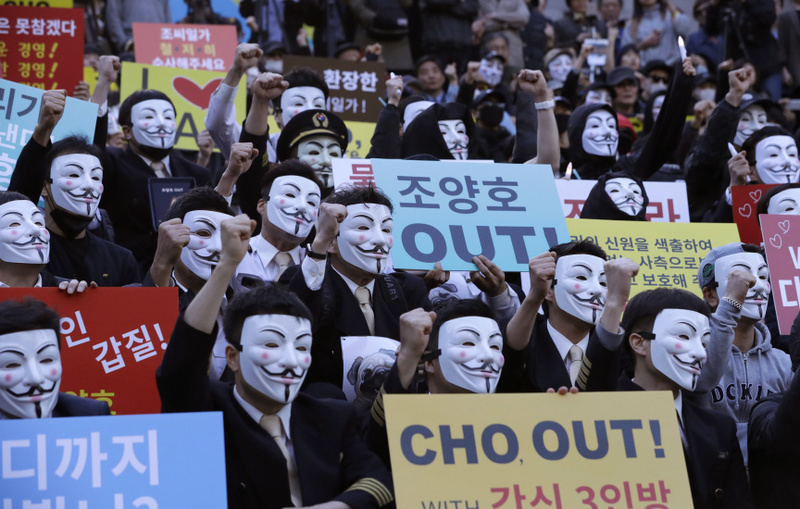 SEOUL, South Korea (AP) — Hundreds of Korean Air Lines Co. pilots, cabin crew and other workers staged a rally Friday night in Seoul saying they can't take any more abuse from the company's founding family. One of the protesters was Park Chang-jin, a crew member who was forced off of a Korean Air aircraft at John F. Kennedy International Airport in 2014, when the company chairman's daughter threw a tantrum over the way nuts were served. "I'm proud of Korean Air. I love Korean Air. Let's protect Korean Air," Park told the roaring crowd. Authorities are investigating multiple charges against Chairman Cho Yang-ho's family, including smuggling and tax evasion. Another of Cho's daughters is under investigation for allegedly throwing a drink at ad agency officials, an allegation that she denies. Such a protest by employees of a "chaebol," the family-controlled big businesses that dominate the South Korean economy, is rare. It reflects growing resentment against perceived outlandish behavior by the elite founding families and the view that they treat publicly listed companies as their private firms. Hiding their faces with identical masks to obscure their identities, the protesters shouted slogans against the Cho family. Many pilots were wearing uniforms and ties. "We cannot take any more curse and power abuse by the Cho family," they shouted in unison. They waved banners that read "Cho, you are fired." Another banner read: "We want to be treated like a human, not a slave."